Monday night’s Steelers-Chargers game was ostensibly a home game for the Chargers, but it sure didn’t feel like one for San Diego Philip Rivers. All the raucous Steelers fans at the stadium made it hard for Rivers to properly communicate with his offense. “We were in silent count. 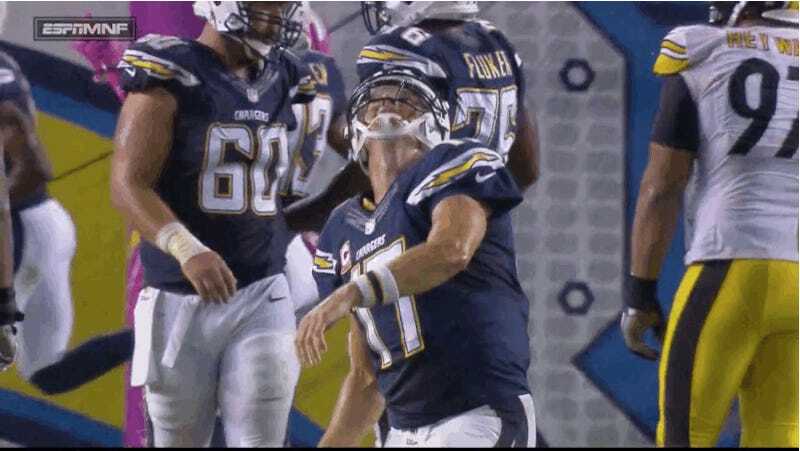 There was no chance,” Rivers said. “We’re checking in and out of plays. I’m usually hoarse after those road games. I’m going to be today as well. I don’t know where to credit for that, whether you give it to Pittsburgh for just how many fans there are, whether they travel or whether they are just all over the place. It would be easy to shame Chargers fans for letting their stadium get overrun by the opposition, but it’s hard to get psyched about plunking down hundreds of dollars to attend a football game when your team is constantly threatening to leave the city.